We want to support more young girls to open their minds and believe that a career in engineering is an opportunity for them. In 2010, a group of tertiary providers developed the National Engineering Education Plan (NEEP). NEEP estimated that an additional 2750 engineering graduates were needed to support an ‘innovation led economy’. In response to the NEEP project, the New Zealand government have allocated over $50 million since 2012 on initiatives to increase the amount of people studying engineering at all levels; technician, technologist and professional engineer. Whilst New Zealand has begun attracting more young minds into the engineering profession, there is still major gender diversity issues. New Zealand needs more women in the engineering profession. The Institution of Professional Engineers New Zealand carried out a study which revealed that only 13% of professional engineers and 16% of engineering technicians were female. We want to change that. The key barrier for young girls entering into the engineering field, real or perceived, is the stereotype of it being a male-dominated profession. The engineering field has an image problem and we need to fix it. Hello Café is addressing this image problem by running outreach workshops for young girls with a human focus - we call it humanitarian engineering. Research shows that young girls are more likely to study subjects that are socially relevant and are motivated by the idea that they can make a difference. That’s why every Hello Café workshop is designed around a global humanitarian issue that requires an innovative solution. Jane breathed life into Hello Café in early 2016 after noticing the severe lack of female engineers, not only in New Zealand, but internationally. 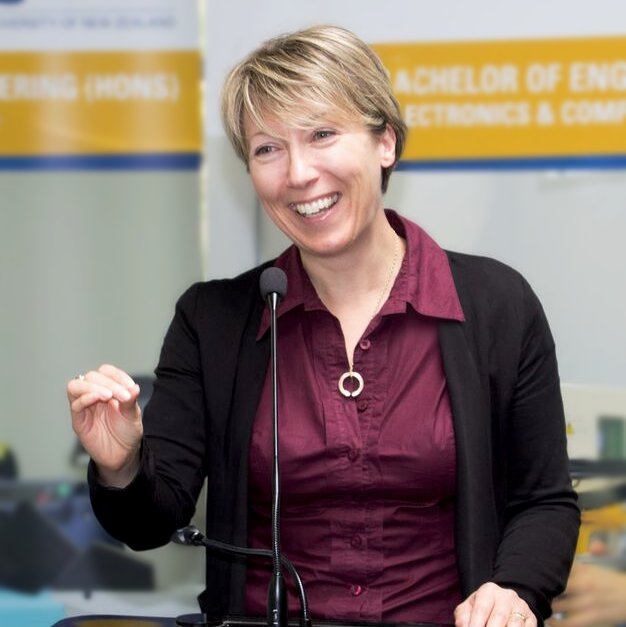 An Associate Professor at Massey University, Jane is eager to encourage more young females into the engineering profession. Over a 30 year career working in universities and with companies such as Jaguar, Aston Martin and Land Rover, she’s always been in the minority. “15% of female engineers is not good enough,” says Jane, “let's change it by inspiring and opening the minds of our young girls to the field of engineering." Hello Café is only possible thanks to MBIE and the ‘Unlocking Curious Minds’ fund. MBIE supports Hello Café along the journey to excite and engage young girls who have fewer opportunities to be involved with science and technology. Hello Café is responsible for the choice and presentation of views and opinions contained in this website, which are not necessarily those of our supporters. For more than 80 years, Massey University has helped shape the lives and community of people in New Zealand and around the world. They’re proud supporters of getting our youth engaged in the world around them and inspiring them to grow. New Zealand has a shortage of technologists, engineers and scientists. Futureintech seeks to promote these career options and help young kiwi’s get themselves into satisfying and well paid roles. Futureintech is an IPENZ initiative, funded by Callaghan Innovation and the Ministry for Primary Industries. Based in the United Kingdom, Coventry University is the lead university for the field of humanitarian engineering in the United Nations Educational, Scientific and Cultural Organisation (UNESCO) network. Hello Café is utilising workshops developed by Coventry University. Based in the United Kingdom, Coventry University is the lead university for the field of humanitarian engineering in the United Nations Educational, Scientific and Cultural Organisation (UNESCO) network. Hello Cafe is utilising workshops developed by Coventry University. Supplying aid to community projects in the form of engineering technical services, Engineers Without Borders is an incorporated society. EWBNZ aims to improve the lives of those in need, and create a society of engineers conscious of global issues and ready to take action to effect positive change. I have some questions about Hello Café, who can I talk to? How many girls are in each workshop? What are the staff-to-pupil ratios? Where were your workshops developed? We are currently planning our cafes for 2017. Please keep checking out our FB page @hellocafenz. For general enquiries, please send an email to hello.cafe@massey.ac.nz. There will be a maximum of fifteen girls within each workshop, this is to ensure each girl gets involved and nobody’s left out . Each workshop is facilitated by two ambassadors. The original workshop materials were designed by Coventry University (UK) in corporation with UNESCO UNITWIN in Humanitarian Engineering and Practical Action (http://practicalaction.org/). The Hello Café project team has adapted the materials to a New Zealand environment. Check out Practical Action here. We are launching the workshops across NZ in 2017. Get in touch by sending us an email or checkout our Facebook.